Coalition forces in Syria have killed two senior ISIS leaders as the terrorist group comes under increasing pressure from Iraqi and Syrian fighters. “The removal of these key ISIS leaders disrupts ISIS’s weapons engineering activities,” says a statement from U.S. Central Command. One of the men, Abu Anas al-Shami, was the ISIS weapons research leader who led efforts to procure explosives and devised plans to use bombs for outside terror attacks. “Al-Shami also oversaw the building of improvised explosives to rig corpses, vehicles and buildings against local forces and civilians to inflict terror, death and destruction,” said Central Command. The bomb specialist was killed by a Coalition airstrike near Mayadin, Syria. The other specialist was Junaid ur Rehman, a senior ISIS engineer and drone pilot trainer. Rehman was developing ISIS’s ability to weaponize drones and conduct aerial surveillance both for operations on the battle field, and attacks throughout the world, said CENTCOM. Rehman was killed by a Coalition airstrike in the village of al-Ashara, also near Mayadin. Speaking from Baghdad Thursday morning, coalition spokesman, Col. Ryan Dillon told reporters in Washington, D.C., that events in Iraq and Syria, including the successful attacks on Rehman and al-Shami, reflected the waning strength of ISIS. “We are witnessing the continued degradation of a morally bankrupt terrorist fighting force whose leaders are detaching, more and more often, from their foot soldiers,” he said. In Iraq, Dillon said Iraqi forces “rolled over” ISIS in Tal Afar. Iraqi Prime Minister Haider al-Abadi announced last week that the town was fully liberated from ISIS after an operation that lasted less than two weeks. Iraqi troops “eliminated and smashed Daesh terrorists” in al-Ayadia district, about 6 miles northwest of Tal Afar Haider al-Abadi said in a statement, using a derogatory term for ISIS. Stabilization efforts continue in Mosul, which was an ISIS stronghold in Iraq before Iraqi forces reclaimed it in battles lasting till July. The city is still infested with ISIS figures and arrests and smaller operations continue there. 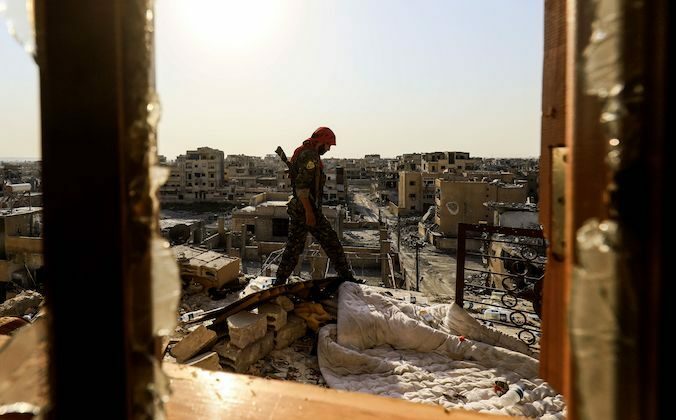 The fighting is fiercer in Syria, where Syrian Democratic Forces (SDF), with the help of coalition forces, are conducting a grueling battle to reclaim Raqqa, the city ISIS claimed as the capital of its so-called caliphate since 2013. Every building must be cleared room-by-room, floor by floor, of booby traps and other dangers. As of this week the SDF has successfully liberated 60 percent of Raqqa including the Great Mosque of Raqqah, said Dillon. Progress comes “building by building and block by block,” he said, describing it as “a very deliberate process” that requires great care to avoid collateral damage and harm to noncombatants. But the fighting has been all one way, he said. SDF fighters have held every block and every building they have gained. 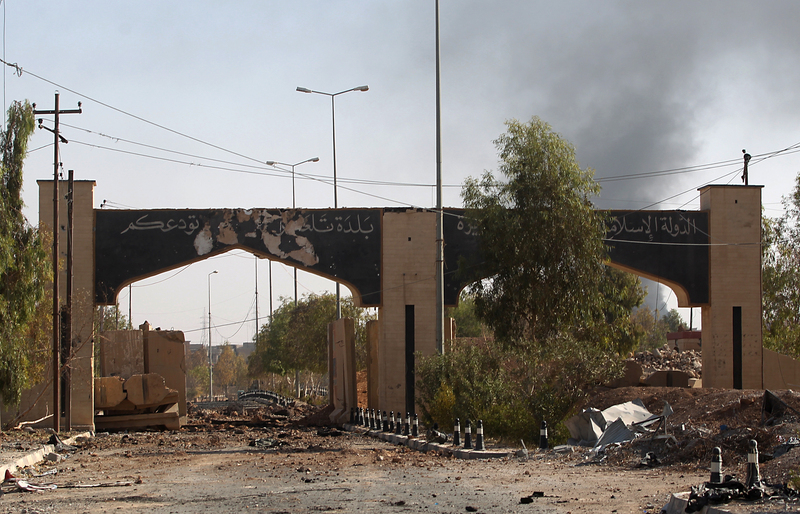 Syrians trapped in ISIS-held parts of the city face a grim choice. Those that run from ISIS must traverse mine fields and ISIS sniper fire. Those that remain know they will be used as hostages and human shields when SDF forces close in. The coalition is also monitoring remnants of an 11-bus ISIS convoy heading south to Iraq under a deal brokered by Lebanese Hezbollah. The coalition is not party to the deal and opposes it. Coalition forces have been picking off vehicles trying to reach the convoy and identified combatants who leave the buses, whether to escape, or to just relieve themselves. But the buses also hold women and children, leaving the coalition forces trying to stop their advance, but with tough options in terms of finally clearing them of combatants. The coalition has hit about 40 vehicles and 85 fighters associated with the convoy, said Dillon.